Colonel Crawford School was expected to name Ted Bruner as new superintendent, replacing Dr. Paul Hickman. The Galion Community Theatre prepared for opening night of the play “High Society” starring Jim Hoover, Cheri Laughbaum and Stephen Phillips. Galion Boy Scouts were pictured honoring the national flag on Flag Day and troops held a flag burning ceremony. Photographed were Stephen Buehrer, Evan LaChance and Matthew Roesch. Wildlife Haven held its annual open house. Freya, the Screech Owl, was pictured as the spokes-owl for the event. Mr. & Mrs. Paul McCleese celebrated dual college graduations. She from Mount Vernon Nazarene University and he from DeVry Institute. Relay for Life raised more money than their goal, by $36K. The Galion KFC team was pictured playing a game of Family Feud against the team from Galion Community Hospital. Mr. & Mrs. Robert Volk and Mr. & Mrs. John Phillips celebrated their fiftieth wedding anniversaries. Jolly Pirate donut shop opened in Crestline. TJ Kruger was pictured watching a shot during the Insurance Youth Golf Classic at the Bucyrus Country Club. He finished the day with a score of 89. David Miller was pictured flying high on his sport motorcycle at the Sunset Ramblers Club. Galion City Police department purchased three new squad cars and the vehicles were 1991 Ford LTD Crown Victoria models. A 23 month old toddler was found sitting in the middle of the street. The naked and very dirty boy was taken to the police department and eventually reunited with his parents. The weather forecast was 80-85 degrees and high humidity. Amanns reservoir was site of tests conducted to determine the population of fish in the water. The Ohio Department of Natural Resources reported that the upper lake has plenty of fish. Species included: bluegills, crappies, large suckers, bass and a few turtles. Neff Brothers grocery advertised round steaks on sale for 79 cents per pound. Mrs. Lawrence Neumann welcomed members of the KEG Club to her home for a Canasta tournament. Prizes were awarded to Mrs. Fred Sprague, Mrs. Martin Shawber and Mrs. Earl Hottenroth. Roger E Fair was named new Junior High School Principal. He came to Galion from West Unity and replaced Howard Deppen. The Rocky Mountain Ranch, 4 miles north of Galion off 598 was open for trail riding, riding lessons and had horses for sale. Sharon Murphy, Nadine Graves, Teresa Hacker, Miriam Vensel, Eileen Bay and Karen Hacker were pictured at the World’s Fair during their trip to New York City. Andy’s Market, 322 S Market St., advertised Hot House Tomatoes 2 lbs. for 19 cents. Seccaium Park announced 10 big vaudeville acts in the pavilion on Sunday night. Roller skating was held daily under the big top at the Rainbow Roller Rink, Harding Way West. Kids admission was only 10 cents. Galion Baseball League leaders played at Heise Park. The Knights of Columbus took on Thompson’s Cities Service in softball and the Galion Iron works challenged Stratbury in hardball. Fishing tackle and equipment, including fishing license was advertised at the Thomas Hardware Company, 110 Harding Way West. 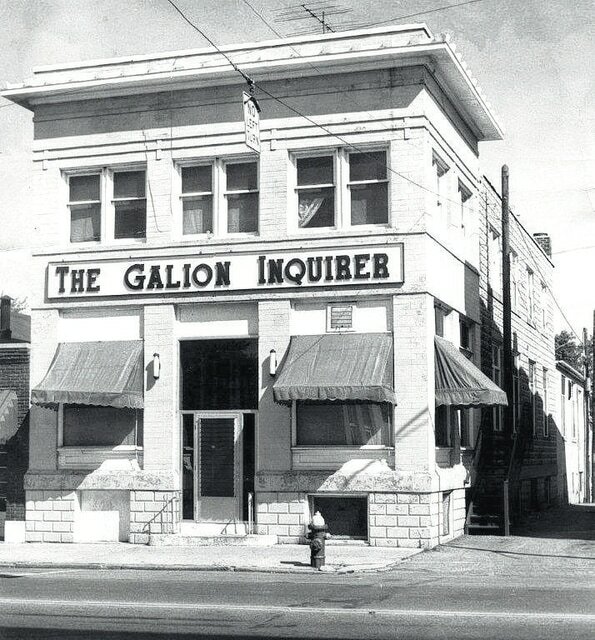 The population of Galion was 8,683 according to the census report released by Mayor W. M. King. The number was up 1009 from the 1930 census.